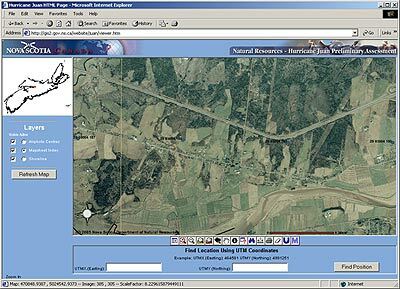 This map service is intended to provide landowners access to an image database that depicts the forest condition after Hurricane Juan hit the province September 29, 2003. Digital orthophotography was used to create the image mosaics. The aerial photography used was flown in October and November 2003. Landowners can use the service to help assess the damage to their properties. The service allows users to locate a property, roam over the image and zoom in to identify damaged stands. The tool buttons at the bottom of the viewer can be used to zoom in and out, pan in different directions - hovering the cursor over the tools will cause the name of the tool to appear. The imagery has been set up to match the provincial map grid system so the initial zoom in can be facilitated by the mapsheet number (e.g. 4505634). The images were captured at a scale of 1:24000. The project has been setup in the UTM NAD83 Zone 20 projection. Disclaimer: The Department of Natural Resources makes no claim as to the accuracy of the data and further stipulates that the user of the data assumes all risks associated with the use of the data.